Well you may remember a couple of months I was saying how hard we were finding everything at the moment. My hips were starting to go, I was banned from lifting due to pregnancy, Sam’s knee was still very much out of use after the cellulitis and due to his disability he does a lot of smallholding activities kneeling so that he has a stable base, the weather was awful with everything flooding and the grass not growing and it all just felt a bit overwhelming. 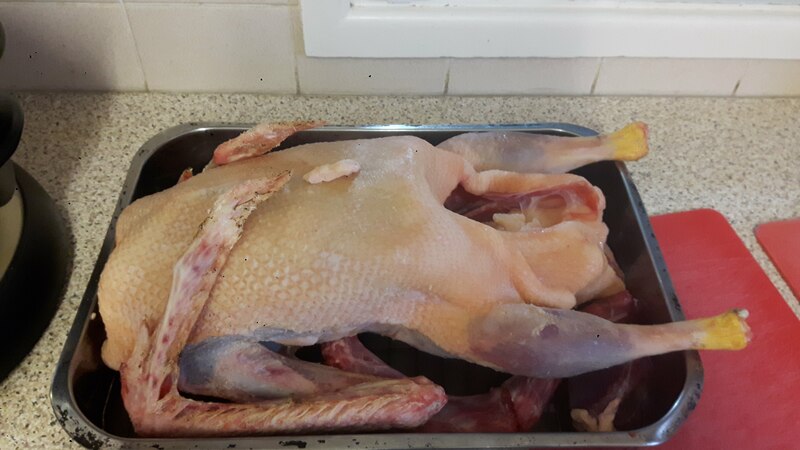 We did send the geese to the freezer after that. The combination of no eggs being laid, running out of grass for them and extra work for Sam when he was already stretched thin, just proved too much. In hindsight I realise I should have either had them jointed or put them up for sale before sending them to the abattoir but hindsight is 20:20. Instead they are in the freezer and will get eaten at some big gatherings through the year. I do really miss having the geese around but in actual fact it has been a blessing, it did relieve the pressure and allowed us to look at the orchard again. The chickens now have safe free roaming of the smallholding and can forage in the orchard, we’ve also set up the broody nursery in there. I noticed a lot of ants and thus aphids on the young fruit trees in there so we will be pulling up our chicken wire ‘goose excluders’ that we have set up around the trees so that the chickens can do a good job scratching around those trunks for ants and other grubs. I like to think we will have geese again but if we do we’ll be changing our management to have them following the sheep grazing. The other area we have scaled back is the growing. I wanted to grow something this year, maybe not expand on last year but still be growing as I loved eating our home grown passata for several months and would like to do it again. 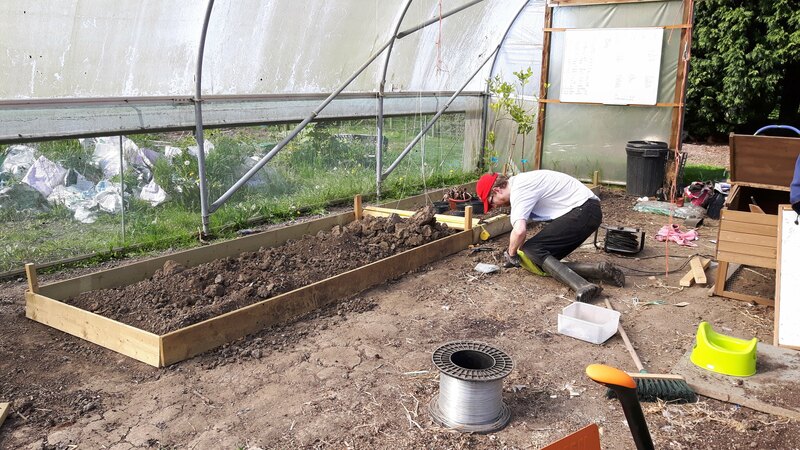 Unfortunately we also decided to work on raising the beds and having the chickens free ranging meant that they were straight into the polytunnel to have dust baths in our beds. As a result of that, and general disorganisation combined with a strong urge to nest meaning I wasn’t sowing seeds until very late, we have only just got our first plants into the polytunnel. Some netting over the unused doors has been a successful short term measure to keep the chickens out but the polytunnel cool enough. We still have nothing outside and we only have 2 veg beds raised in the polytunnel. The growing is most certainly scaled back this year. All of this may be for the best though. The baby is due in August which is our peak harvest season in the polytunnel. We are unlikely to be able to do much in the way of food processing this year and no matter what we do the plum, apple and pear trees will be dropping their fruit on us which will likely mostly go straight into the freezer. Not growing as much and focusing on the infrastructure should hopefully set us for a good growing season next year. At least that is what I keep saying to myself when I see how empty the polytunnel and outdoor beds are! I am hoping that by this time next year we will have a covered fruit cage with planted bushes (that will mostly be 3 years old and thus should be in good production), 5 raised beds in the polytunnel and possibly the citrus trees planted, internal netted doors on the polytunnel and the 5 raised beds outside. Reading a smallholding magazine the other week (likely a back issue as I’m a bit behind) there was an article by the author of Doing It In Wellies (a book I really really want to read). She spoke about getting the smallholding and jumping into everything and forgetting the why of it all because you were too busy trying to survive it. That really resonated with me. She said how they pulled some bits back and stopped to smell the roses and how that really helped them refocus the activities. Sam and I got into smallholding for several reasons. The first was my health at the time, the PhD had worn me into the ground and down a few layers. We thought a slower pace of life, without as much of the pressure(!) might be helpful. I could do lots on my good days and less on the bad days. For the most part that has worked. Smallholding can be very stressful. There’s never enough hours in the day to get things done. Trying to make a business out of that makes it harder, there isn’t just the physical acts of smallholding and record keeping for animals, there’s also things like this blog, website design and management, courses to do to get the various food safety requirements, endless research, balancing books etc. Then add in the stress of pests, disease and never ending maintenance that any smallholding needs and there is the potential for stress. Throw full time motherhood into the mix and you’d start to question if a PhD might be a relaxing break! But in all honesty nothing I’ve experienced touches the PhD for stress, all the stress related illness I suffered from have disappeared. I am pretty much medication free now, just a vitamin D supplement. I’ve also lost a good 10kg and have put on a lot of muscle. I’m healthier than I have been in a long while and I have the smallholding to thank for that. Job #1 done! Our second reason was Chi, we wanted her to know where her food comes from. Not just know where but to see it come from there, to understand the process, to know it well enough that she can do it herself. She makes cakes and custard with me, she has watched me kill and pluck and gut chickens, she’s seen me salting sheepskins, seen the wool being sheared, washed, carded and spun. 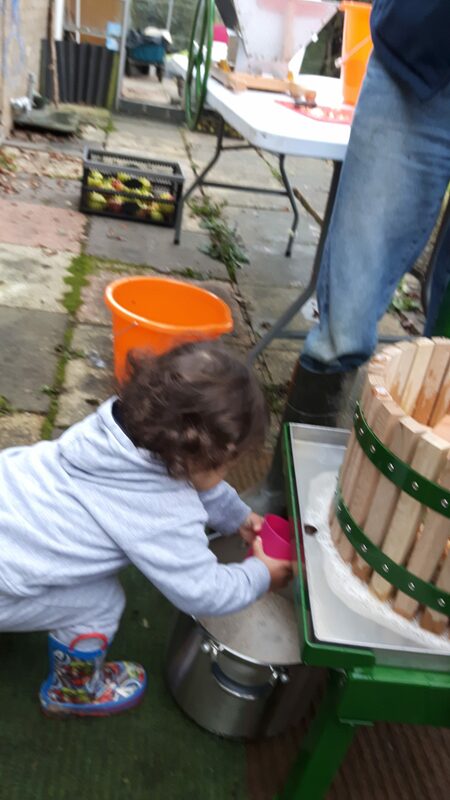 We have picked apples off the tree and pressed them into juice. As her memory gets longer she will start to see and learn the process of growing, of the seeds we sow and plant and water then harvest and compost. She is learning so much and the beauty is she doesn’t know that she is. It isn’t a special trip out or an episode of a show, this is simply her life and I love it. Job #2 done. We wanted to know the history of our food, that the animals had a good life and the crops hadn’t been saturated in pesticides. We aren’t as self sufficient as we would like, I would love a goat or two to produce milk for us as we still buy a lot of dairy. I’d also like pigs for meat and at the very least a local known source of beef, but we have a small acreage and we are doing what we can with what we have. I think the dream of a bit more land will always be with me but we are doing well in lamb (well mutton), fruit and veg, eggs and pork sourced from other smallholders. So job #3 is in pretty good standing too. Lastly we wanted to enjoy things. This is where we are lacking a bit. 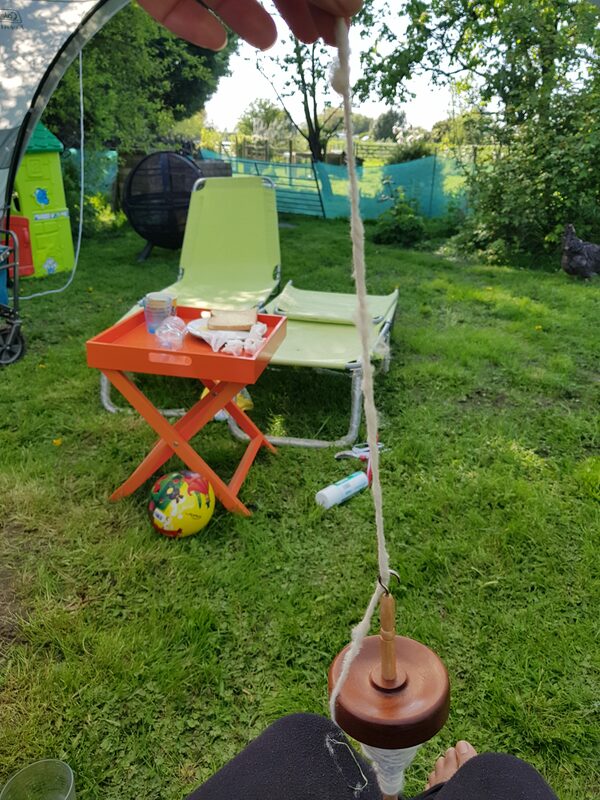 We work a lot on the smallholding, we put a lot of hours into getting the place up and running, especially Sam working a full time job and then doing work on the smallholding. Sometimes I think we work so hard on it all and don’t actually enjoy it. I think that is where we got to earlier in the year. Lots of work and very little enjoyment. We’ve got a table set up in the garden for BBQs and have had more this year than the other years previously. We are getting some more garden furniture to dot around so that we can sit and rest between jobs and enjoy things rather than lugging our 2 chairs back and forth over the smallholding. I am hoping that this year we will get more of the infrastructure done and build on enjoying the smallholding next year. Wish us luck! P.S. As always if you like the post, give us a thumbs up, and if you want to be notified of every blog post then subscribe – there’s a button to the left or below if you’re on a mobile device. It’s always nice to know people are out there and reading.